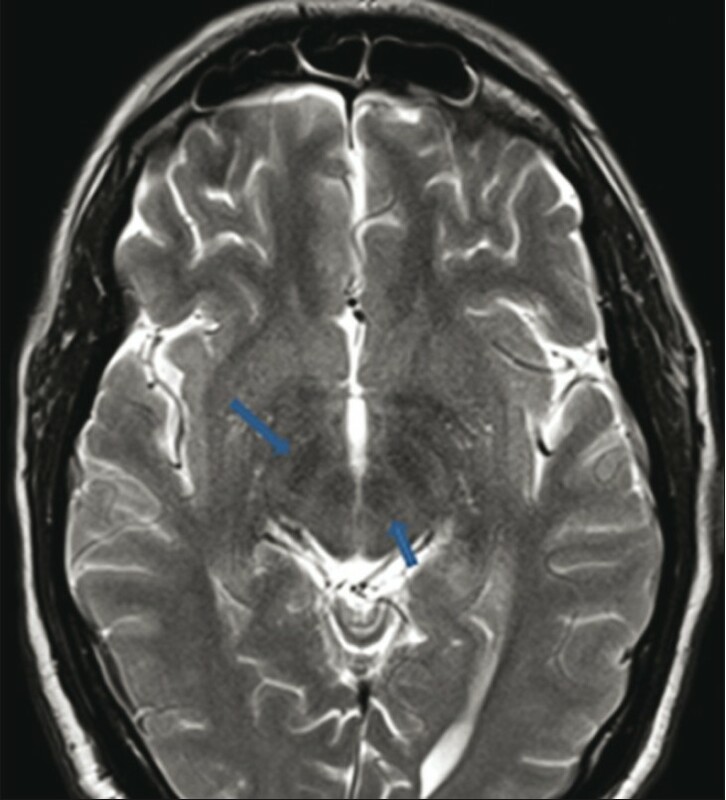 A 14-year-old boy presented with chief complaints of progressively increasing abnormal movements, gait disturbances, speech difficulty, and intellectual decline since the age of 10 years. He was born at full term to consanguineous parents. No history of perinatal hypoxic insult or delayed milestones was present. No relevant family history was present. Neurological examination revealed a generalized increase in limb tone, dsytonia, and hyperreflexia with extensor planter responses. Ophthalmic evaluation was normal. No evidence of Kayser-Fleischer ring More Detailss or retinitis pigmentosa was seen. Serum copper, iron, and ceruloplasmin levels were within normal limits. Blood smear was positive for acanthocytes. 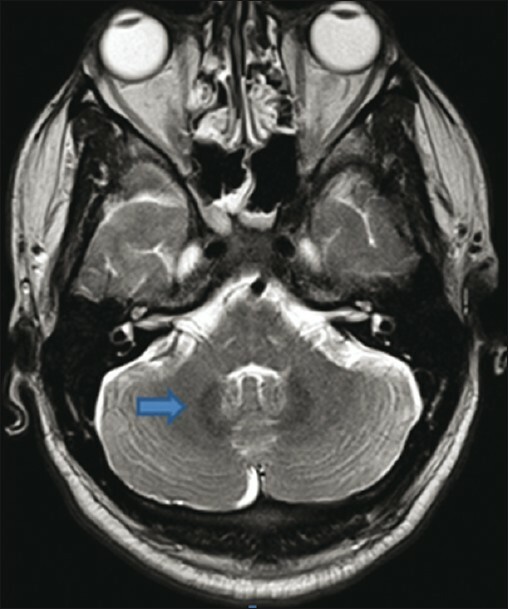 Magnetic resonance imaging (MRI) of brain revealed bilateral anteriomedial hyperintensity surrounded by a region of hypointensity in the medial globus pallidus on T2- and T2*-weighted images (eye-of-the-tiger sign). 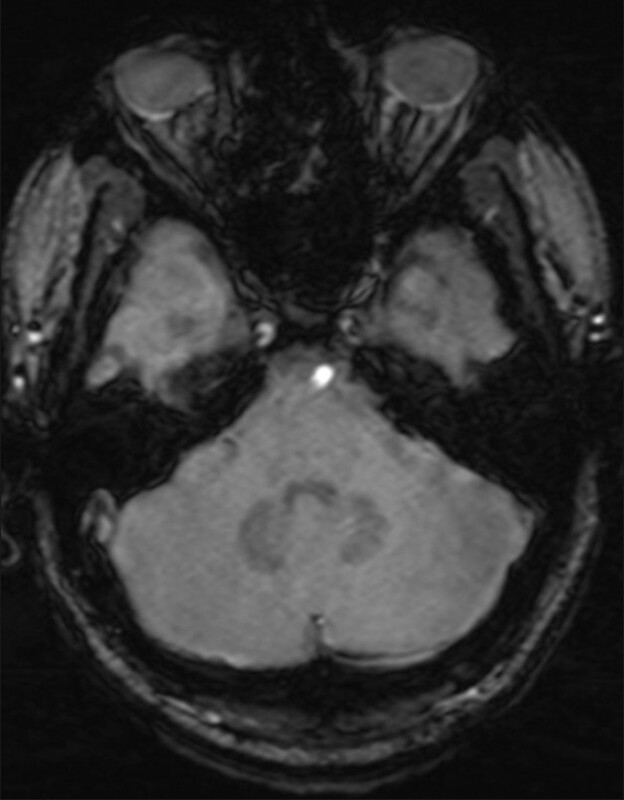 Similar hypointensity was also seen in dentate nuclei, red nuclei, and substantia nigra [Figure 1], [Figure 2], [Figure 3], [Figure 4], [Figure 5] and [Figure 6]. Neurodegeneration with brain iron accumulation (NBIA) is a clinically and genetically heterogenous group of disorders characterized by brain iron deposition and associated with neuronal death. The causes of NBIA comprise pantothenate kinase-associated neurodegeneration (PKAN), neuroferritinopathy, infantile neuroaxonal dystrophy, and aceruloplasminemia. PKAN is a rare autosomal recessive neurodegenerative disorder. The diagnosis is usually made in first decade of life or in early adolescence. The clinical phenotype that is associated with mutations in the pantothenate kinase 2 gene, PANK2, is termed pantothenate kinase-associated neurodegeneration (PKAN) and is usually classified into classical or atypical forms. Classic PKAN is characterized by early age of onset, usually before 6 years, and rapid progression. The main clinical (extrapyramidal) features are dystonia, speech disturbance (dysarthria), and rigidity, with corticospinal tract involvement resulting in spasticity, hyperreflexia, and extensor planter responses. Patients with atypical PKAN have a later onset of symptoms and progression is slower. The average age of onset is 13-14 years. Iron levels in CSF and blood are within normal limits. 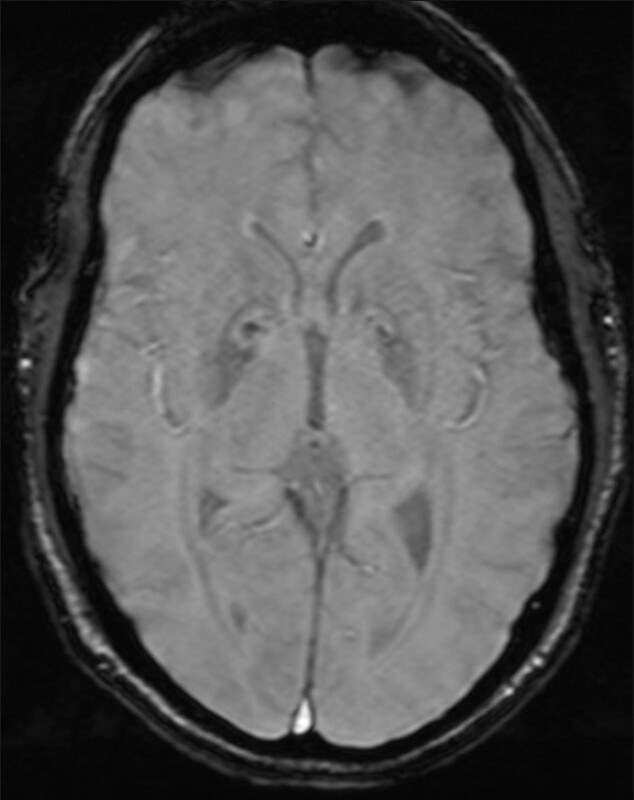 Neuroferritinopathy and aceruloplasminemia present in adult or late life. Iron deposition abnormalities are also seen in non-inherited disorders such as in beta-thalassemia major, HIV and Wilson disease, where T2* hypointensities of the globus pallidus, caudate nuclei, and putamen have been described. 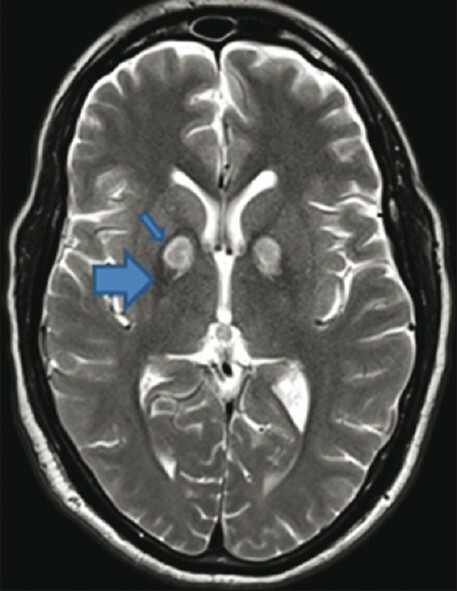 Thus, an eye-of-the-tiger sign must not be interpreted in isolation; scans should be looked for involvement of other basal ganglia nuclei and cerebral cortex. 1. McNeill A, Birchall D, Hayflick SJ, Gregory A, Schenk JF, Zimmerman EA, et al. T2* and FSE MRI distinguishes four subtypes of neurodegeneration with brain iron accumulation. Neurology 2008;70:1614-9. 2. Gregory A, Hayflick SJ. Neurodegeneration with brain iron accumulation. Folia Neuropathol 2005;43:286-96. 3. Halliday W. The nosology of Hallervorden-Spatz disease. J Neurol Sci 1995;134:84-91. 4. Hayflick SJ, Hartman M, Coryell J, Gitschier J, Rowley H. Brain MRI in neurodegeneration with brain iron accumulation with and without PANK2 mutations. 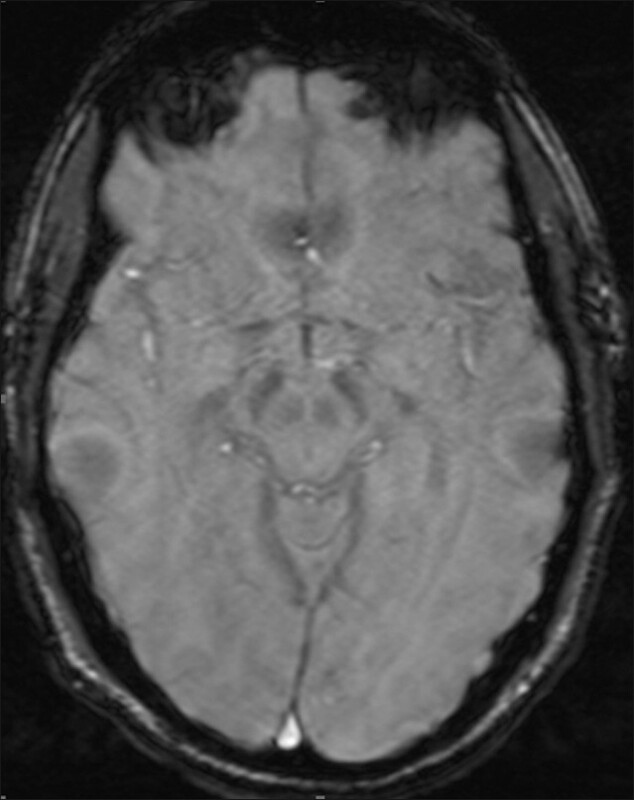 AJNR Am J Neuroradiol 2006;27:1230-3. 5. Guillerman RP. The eye-of-the-tiger sign. Radiology 2000;217:895-6.